An energy gift from the Galactic Council arrived unexpectedly this morning. Interestingly it was transmitted through the Ashtar Command and ‘deposited’ directly into my third eye. I was told this energy transmission is specifically for expanding our Universal Heart Chakra, one of the higher chakras in our 5th dimensional (5D) energy body. Scroll down for more information on this chakra. Whilst the heart chakra of our 3D body is calibrated to synchronize with the vibrational rhythm of the Pleiades Star System, the Universal Heart Chakra aligns our energy body and super-consciousness with the Sirius Star System, gateway to the core or heart of the Milky Way Galaxy. The more we aligned ourselves – body and mind – with the Galactic Core by working on our Universal Heart Chakra, the more accelerated humanity’s transformation into a Galactic race can be, meaning evolving to a 5D collective consciousness which has reconnected with its God Self. As I write this message, the energy codes received from the Galactic Council and Ashtar Command are being released from my third eye to be embedded in this transcript. If you feel the pull, practise the following meditation to ingest and assimilate these energy keys into your 5D energy field. 1. In a meditative state, ask to align your third eye chakra with the Ashtar Command by saying this mantra once : Tzequitilah Yanu (pronounced as Ze-Key-Ti-La Ya-Nu). 2. You may feel an unusual sensation round the third eye and have an image of beams of bright blue energy projecting from your third eye in all directions. If you do not have this experience, it’s perfectly normal since our bodies respond differently to energy transference and infusion. 3. 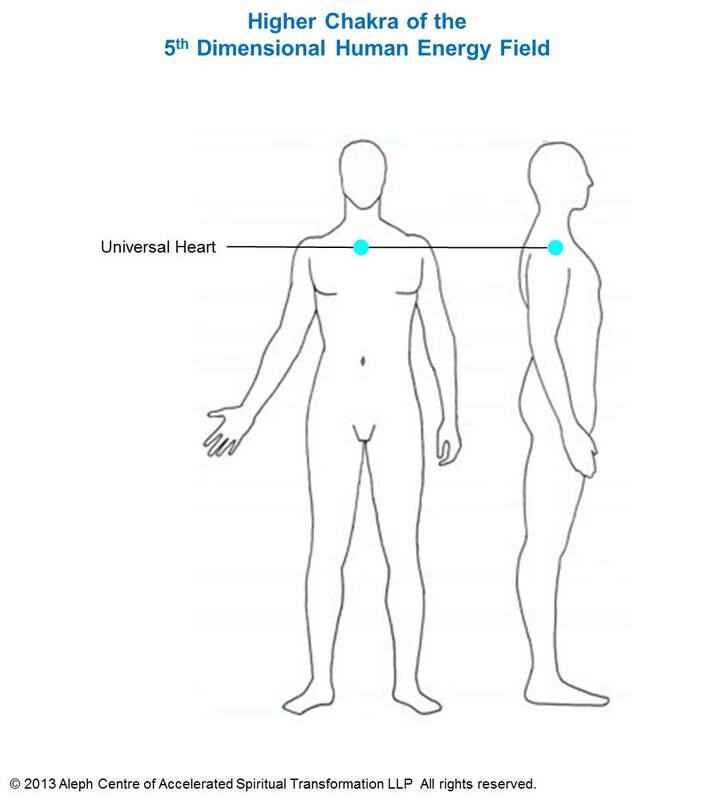 Inhale deeply and direct the blue rays down to the Universal Heart Chakra (see diagram below for its location). 4. You may begin to feel your heart pulsating at a faster speed, the upper chest feeling warmer or your breathing becoming heavier. 5. Continue with step 3 until you have a sense that the activation of your Universal Heart Chakra is complete and the sensations as described in step 4 have settled down. Qualities: Through the higher chakras of the 5D human body, we are resonating more with the consciousness of the Earth and the entire solar system as a collective soul. Unconditional love is the essence of this interconnected matrix of consciousness. The Universal Heart chakra is the portal to these higher connections. It also helps us to heal limiting archetypal and ancestral energies embodied in our memories. Working with the Universal Heart, brings together the personal heart, mind and will and raises their vibrations to the essence of unconditional love. Inner healing in this way is supported with compassion (heart), clarity (mind) and courage (will). So people do ‘understand’ or recognise the patterns or issues they are seeking to heal, but can do so without judgement and without fear. For most, it would feel as though you are stepping out of the frame, and able to observe your movie without emotionally reacting or participating in the scene. Included in this E-learning course is the attunement to the Sirius Star System (through your Sirian guides) and the activation of the 5 higher chakras of the 5D human body, one of which is the Universal Heart Chakra discussed above. To find out more, please go to Isis Sirius Alchemy Healing Self-Study. May the Sirius Blue Star illuminate our path of Remembering and Becoming ONE. Blessings, Amara Tia Ann. Update in May 2014: Next workshop on Isis-Sirius Alchemy Healing will be held in Melbourne on 4-5 October this year. Go to Event News for info. Please register your interest or email your enquiries to Cecily Leong at cecilyleong@mail.com. Ann, I want to express my gratitude to you for your service , for your choice to serve and for the messages and information you share with all of us on your list .